Volvo is writing to 158,000 owners in 30 European countries alerting them to the potential problem. S80 from 2007-2009, the V70 and XC70 from 2008-2009, and the XC60 from 2009. London, England (CNN) -- Volvo has issued a warning about unintended acceleration in several of its latest models, Volvo Cars corporate spokesman Per-Ake Froberg told CNN Tuesday. The problem occurs when engine oil enters the combustion chamber and acts as additional fuel, Froberg said in a phone interview from Gothenburg, Sweden. "This has caused the engine to maintain or even increase its speed, even though the driver has removed his foot from the gas pedal," Froberg said. "We have not had any accidents reported as a result of this, though. In the instances when this has occurred, the drivers have put the gear in neutral and stopped on the side of the road," he said. So far there have been 55 cases of unintended acceleration reported, and Volvo will now send a letter to the owners of about 158,000 cars in 30 European markets, alerting them of the problem. The first customers will get the letter by the end of the week. 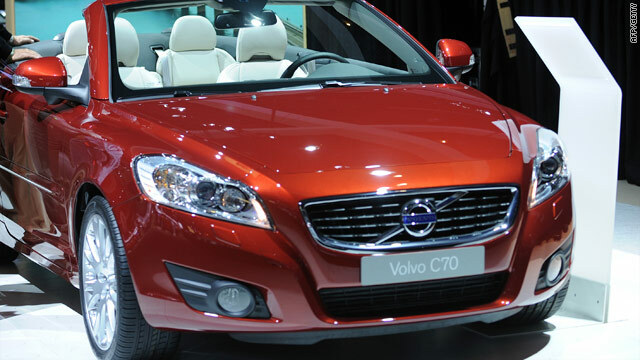 The affected five-cylinder diesel engine models are the Volvo S40 and V50 from 2006-2010, the C30 and C70 from 2007-2010, the S80 from 2007-2009, the V70 and XC70 from 2008-2009, and the XC60 from 2009. "The problem is that today's diesel fuel has a lot of biodiesel mixed in with it, and that doesn't evaporate like normal diesel," Froberg explained. The engine is constructed to inject extra fuel through a particle filter when the filter clogs up with particles. The purpose of this is to clean the filter, but for some reason, the extra fuel doesn't burn and ends up in the engine oil. Over time, the engine oil level rises, which can lead to engine oil ending up in the combustion chamber, causing the engine to maintain or increase its speed, according to Froberg. "We are urging customers to keep an eye on their oil level, which they should do anyway. If it is under the maximum level they don't need to do anything. If it has risen above the maximum level they should contact their Volvo shop and they will remove the extra oil," Froberg said. So far, Volvo doesn't have a fix to permanently take care of the problem. "We don't know when we will have a robust solution in place, but as long as the customers keep an eye on the oil level, they have nothing to worry about," Froberg said. Automaker Toyota is currently facing numerous civil lawsuits over crashes allegedly caused by "unintended acceleration" in Toyota and Lexus vehicles.